Regardless of experience, I had somehow lost track of just how little overlap there can be between the driving concerns of a conservatory and the preoccupations of musicology as currently practiced in many tenure-granting institutions. It seems to me that the focus of musicology as a discipline has increasingly been trending away from the repertory that concerns the majority of my conservatory students, which is the traditional Western canon. The main occupation of performance students is exploring the “how” of music-making. This is mostly the domain of their studio teachers. As a scholar whose specialty is eighteenth-century music, I can also help them with the how when it comes to dealing with manuscript sources and certain matters of performance practice. But I think my bigger purpose, though, might be to help them explore the question of why one makes music. I have to thank a discussion with my new colleague Eliot Fisk for helping me frame my job in this way. For me, pathways to answering the hows and whys of music lie in an understanding of music’s history—the story of humanity’s passionate relationship with organized sound. Music’s history offers us the collective wisdom of millennia as companionship for our own journeys to Parnassus. I see it as part of my job to help students know that. We all know that every institution has its own culture. The culture of conservatory teaching, for those of us on the academic side, has its shares of joys and sorrows. One of the greatest joys in this case is communicating about music at a very high level with students who are steeped in the repertory. I don’t have to sell them on the glories of the art. They’re betting their livelihoods on the continued relevancy of Western Art music in contemporary culture. On the other hand, it will shock hardly anyone reading this blog that the priorities of conservatory students rarely include academic coursework. That said, there are plenty of wonderfully curious and brilliant students in every class, just as there are those who will never see the value of losing practice time to homework. I hope, for their sakes, that they are right. I doubt it, though. For my part, I firmly believe that the power of knowledge can build better players. 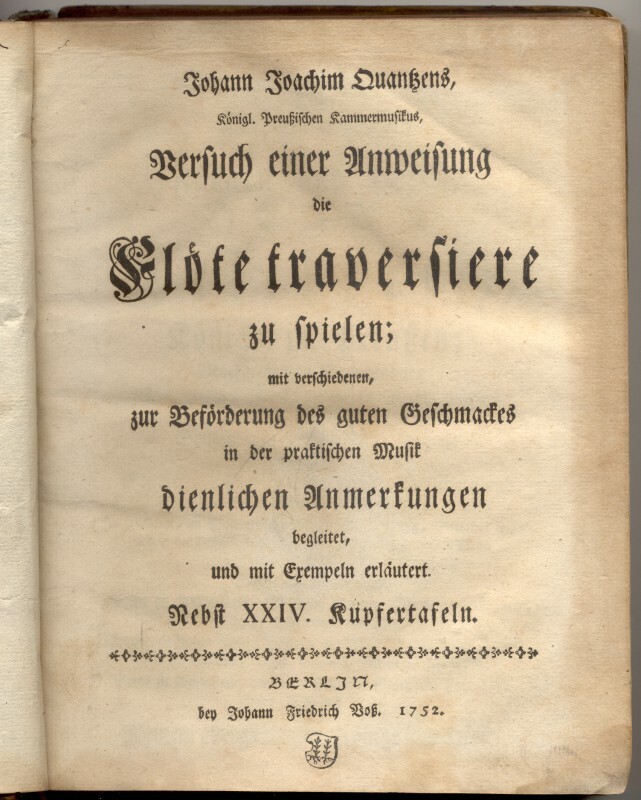 Because I spend my research time working with eighteenth-century sources, I recently assigned for the delectation of graduate students in my seminar “Music in Berlin, 1700-1800” the writings of two of my favorite fellow travelers to Parnassus: the great virtuoso performers, composers, and writers Carl Philipp Emanuel Bach (1714–1788) and Johann Joachim Quantz (1697–1773). 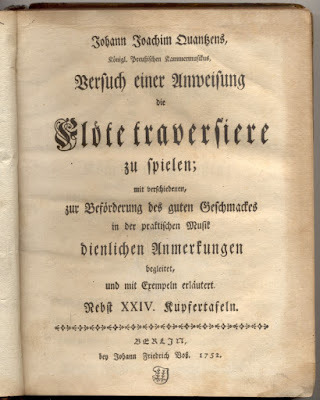 In fact, I borrowed the first half of this blog entry’s title from the Introduction to Quantz’s Versuch einer Anweisung die Flöte traversiere zu spielen . (I assigned it in translation, of course.) I thought my students might find it enlightening or at least entertaining to read career advice and opinions on what makes a successful performer from the famously accomplished, even at the remove of three centuries. It turns out that the wisdom of Bach and Quantz sounds surprisingly fresh, even in an era that seems to believe it has invented musical entrepreneurship. There were a number of passages in these two treatises that attracted particular attention. My students seemed to sense a kindred spirit in C. P. E. Bach, whose descriptions of effective performances in the eighteenth century provoked recognition and even approval, even if his music has been a harder sell. Now that they have read some of Bach’s treatise (Versuch über die wahre Art das Clavier zu spielen [1753, 1762]) and learned about his cultural and intellectual context, they have insight into his aesthetic priorities and a better understanding of what he meant his music to communicate. If my students develop from this at least an appreciation for what Bach was doing, if not quite an affection, I will call it a win. “He who does not possess sufficient natural gifts for academic study probably has even fewer gifts for music. Yet if someone who gives himself to academic studies has sufficient talent for music, and devotes just as much industry to it as to the former, he not only has an advantage over other musicians, but also can be of greater service to music in general than others … [S]erious counsel must be given to young people who dedicate themselves to music that they endeavor not to remain strangers at least to those sciences mentioned above [mathematics, philosophy, rhetoric], and some foreign languages besides, even if time does not permit them to engage in all academic studies” (¶ 19). They understood what Quantz was suggesting and why: acquiring an education and learning to be discerning and articulate helps music’s cause, and therefore theirs, profoundly. I can’t be sure, but I think these readings helped them justify spending further time considering the aesthetics of Berlin’s unique repertory (even though they seldom play it), especially that which issued from the pens of Quantz and Emanuel Bach. Hopefully the lesson that knowledge is good also stuck. Academic writing that yields useful reflective opportunities for performers is not always easy to find. I feel a particular responsibility to conservatory students to provide them with information they can use, to craft assignments that will build their musical thinking and demonstrate the benefits of seeking out the written word as a nourishing companion to musical practice. I am surprised to find myself, a few years into my teaching career, again at the beginning of a journey. Preparing for each class with a special focus on linking scholarship to repertory is hard work but it also feels refreshingly honest and like a return to what drew me to music scholarship in the first place. Ellen Exner has recently joined the full-time faculty at New England Conservatory in Boston following three years as Assistant Professor of Music History at the University of South Carolina. She is a member of the Editorial Board of the American Bach Society and serves as Editor of its official newsletter, Bach Notes. Panorama is the largest steelband competition in the world held every year during the carnival season in Trinidad and Tobago. It features the steelpan, the national instrument of Trinidad and Tobago, which has become an iconic symbol of the country’s culture. The steelpan has gained visibility and a growing reputation around the world in countries such as the United States, England, and Canada. These countries have large Trinbagonian communities, which promoted the creation of steelpan cultures away from home. These international steelband communities are often represented within Trinidadian steelbands at Panorama. The international presence within Panorama over the past ten years, however, has expanded to include Japanese pannists. Japan has a small but significant population of Trinbagonians, and the steelband communities in Japan are growing at a fast pace with the presence of Japanese pannists in Trinidad’s Panorama is expanding exponentially. Why is the steelpan becoming so popular in Japan, a country that has a small number of Trinbagonian immigrants? Why do Japanese pannists travel halfway across the world every year to compete in Panorama? My dissertation sought to answer these questions. As an ethnomusicologist, conducting research in Japan as a participating observer is essential to understanding the cultural and societal intricacies that are present within this steelpan world. I have spent several months in Japan interacting and performing with Japanese pannists. While conducting fieldwork in 2015, I became very close with many of my Japanese friends. We grew a stronger bond as we discussed the steelpan world in Japan, made fun of silly music videos on YouTube, and even rambled about our personal lives. With 2016 Panorama approaching, I felt a sense of responsibility for my Japanese friends since they were traveling to my home country to participate in our competition and I was aware of the major cultural and language differences that existed between Trinidad and Tobago and Japan. Consequently, I asked many questions: Where are you staying? What steelbands are you performing with? How will you get to and from rehearsals? I just wanted to make sure that they were comfortable during the carnival season. I am convinced that these interactions with my friends in Japan and the strong bond we share are the reasons I felt numb when one of my Japanese friends messaged me a few days after Panorama stating that Asami Nagakiya was missing. This message came to me after seeing the local news broadcast a few hours prior asking the public’s assistance in identifying the body of a young Asian female found after the carnival celebrations were over. Within 24 hours, the body was identified and the cause of death was revealed as strangulation. Therefore, Asami’s death was ruled a homicide. The following weeks became an unexpected whirlwind for many pannists in Trinidad and in Japan. News companies from both countries were requesting public statements, police officers were seeking interviews, and many people used social media to express their reaction to Asami’s death. My family and friends were worried about my return to Japan. “How are they going to treat you? Do you think they will take their frustration out on you?” were some of the questions I received. Someone also jokingly stated, “Don’t participate in Japanese carnival just in case someone wanted to kill you for revenge.” These questions and comments made me think long and hard about the impact Asami’s death had on other Japanese pannists and Japan by extension. After all, Asami was a talented pannist with an extraordinary gift for music and was loved by many. On March 15, 2016, I returned to Japan without any idea of what to expect. Were my friends going to lose trust in me as a Trinidadian? Would they ever return to Trinidad? Perhaps they will never play steelpan again and discourage others from doing so. Was someone really going to try to kill me for revenge? These were thoughts that stormed my mind on my way to Japan as I reflected on the times I spent with Asami. When I arrived, I quickly realized that I was wrong and I didn’t have anything to worry about. I had many conversations with Japanese musicians who regularly visit Trinidad. They told me that Asami’s death has given them motivation to continue promoting Trinidad’s culture within Japan. They hope to return to Trinidad for future carnivals with intentions of participating in more events. They also want to encourage others to do the same. While many Japanese pannists consider Asami’s death an isolated event and a “crime of passion,” they do think that there are major cultural differences that can lead to dangerous situations. For example, while it is safe to walk the streets alone late at night in Japan, Trinidad and Tobago highly discourage this activity due to the rapid increase in crime over the past few years. Due to such differences, some Japanese musicians are forming an unofficial organization to help promote the safety of Japanese visitors during carnival time in Trinidad by offering important sources that can lead to a better understanding of Trinidad and Tobago’s culture. The death of Asami Nagakiya has taught us several lessons including the unpredictability of life and the realization that horrifying tragedies are always possible. However, her death serves as a cautionary tale that reveals the importance of cultural knowledge and sensitivity when entering another culture different to one’s own, and exposes the complexities of international and intercultural mingling that can be formed during ethnomusicological processes. It also raises ethical questions for the researcher, as such a delicate situation forms complex responses by interlocutors based on sensitive emotions, and as a result, determining what should and should not be used in a public forum such as a dissertation is difficult to determine. To conclude, many Japanese pannists, among others, are anxiously awaiting the arrest and persecution of Asami’s murderer. In the meantime, as eloquently stated by one of my Japanese friends, “Let’s not forget about the music. We will continue to play on in Asami’s memory!” And so we shall. Mia Gormandy is a PhD candidate in musicology at Florida State University where her dissertation research is based on the steelband communities in Japan. She is the 2014 recipient of the Howard Mayer Brown Fellowship awarded by the American Musicological Society.